Ships within 10 business days. Please allow up to 1 additional week transit time for your item to arrive. 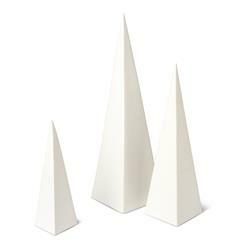 Simply stunning, this trio of ceramic pyramids is simultaneously ancient and modern. Matte white, the clean, precise geometric lines add an architectural element to any collection. They make a bold statement on any end table, shelf or bookcase.